It happens all the time when you’re trying to be non-toxic. You throw out your evil, no-good, terrible product, and realize your non-toxic replacement is just not as good. Laundry detergent that doesn’t quite clean as well, eyeliner that barely lines, deodorant that leaves you odorous–they all exists. Good replacements can be found, but you have to do some searching. Formaldehyde, dibutyl phthalate (DBP), and toluene are the dirty three everyone always talks about, but now new brands of nail polishes have hit the shelves claiming to be 5-free. That includes jettisoning formaldehyde resin and camphor as well. So they are squeaky clean! 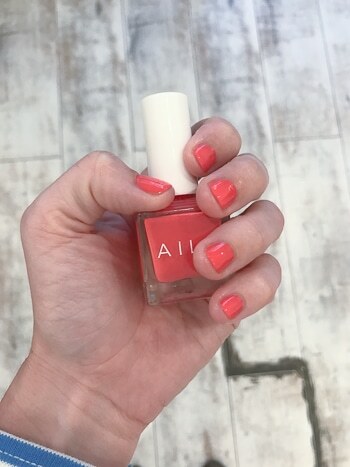 Well + Good did a nice roundup of 5-free nail polishes. 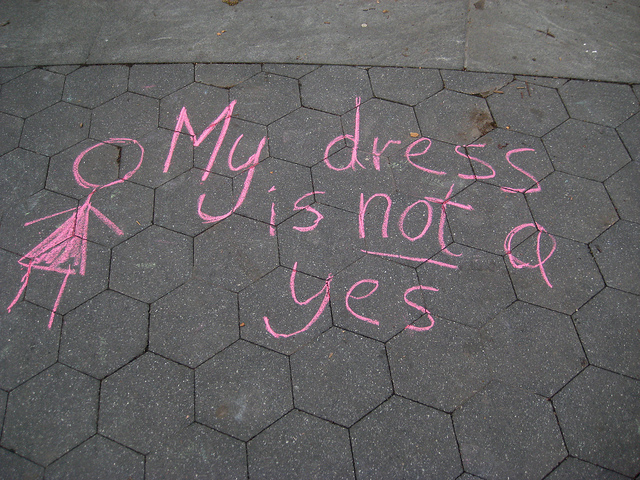 And Scotch and Priti seem to be dominating the media coverage … but do they work? 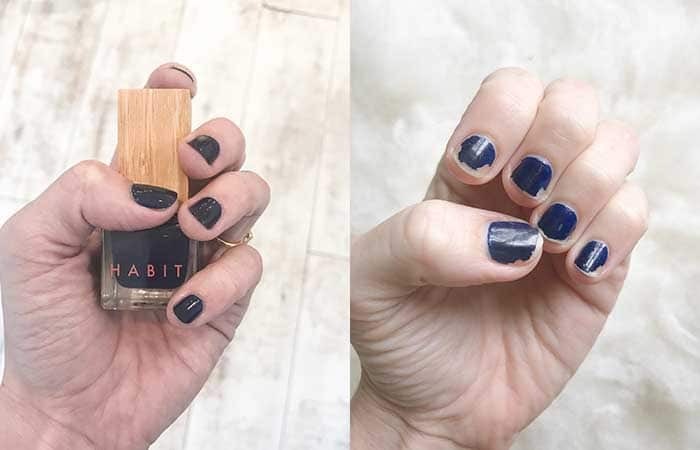 Habit is a natural strengthening nail polish made with Myrrh Extract. It’s PETA-certified as vegan and cruelty-free, gluten-free, free of Toluene, Formaldehyde, Formaldehyde Resin, Camphor, TPP, Xylene, Phthalates, Parabens and Fragrances, and is made in the U.S.A. It goes on smoothly, and after a week of wear chips some. Conclusion: Not bad, but not the best on the market. 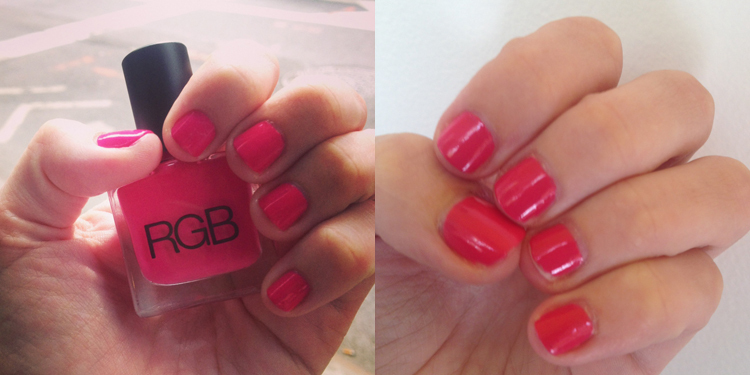 Sundays, which also has a new salon in Midtown Manhattan, says its polishes are 10-free. That includes: phthalate, toluene, xylene, ethyl tosylamide, camphor, formaldehyde, formaldehyde resin, parabens, and tert-butyl hydroperoxide. 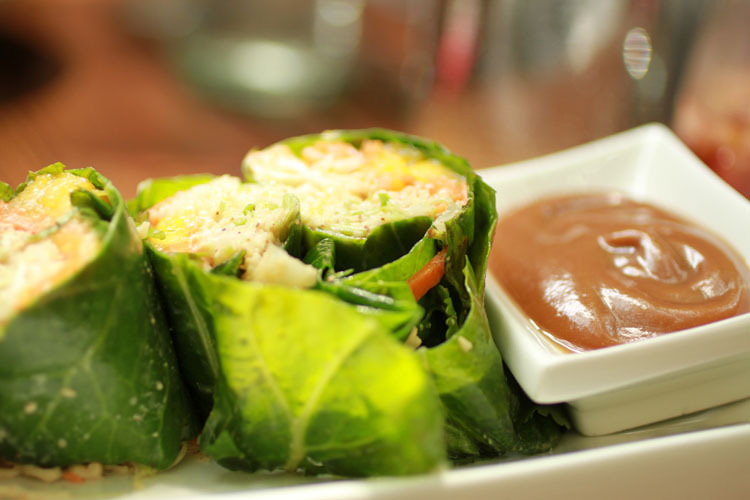 The 10th ingredient they don’t use is anything derived from animals, so yes, it’s vegan, too! I was very, very impressed with how beautifully it goes on and stays on. Plus, there is a whole range of classy colors to choose from. 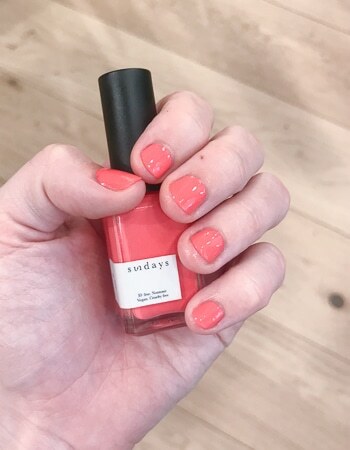 This nail polish comes in modern, minimalist packaging in every color a modern woman could want, from bright, summery colors, to classy neutrals, and mermaid glitter. It’s an 8-free polish, without formaldehyde, toluene, DBT, camphor, parabens, triphenol phosphate, sulfates, gluten, or animal products. I had it put on at my favorite salon, and it went on smoothly with just the right thickness. I actually think the above photo is misleading, because I took it after a week of wear and two hours of scrubbing my bathroom! 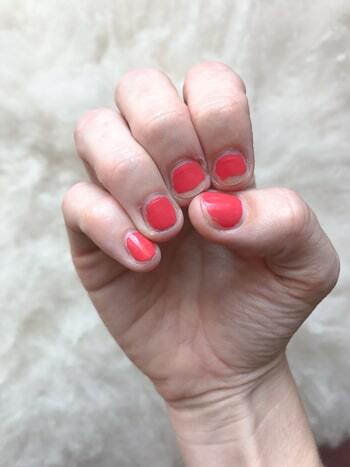 This non-toxic nail polish put the “water” in water-based. 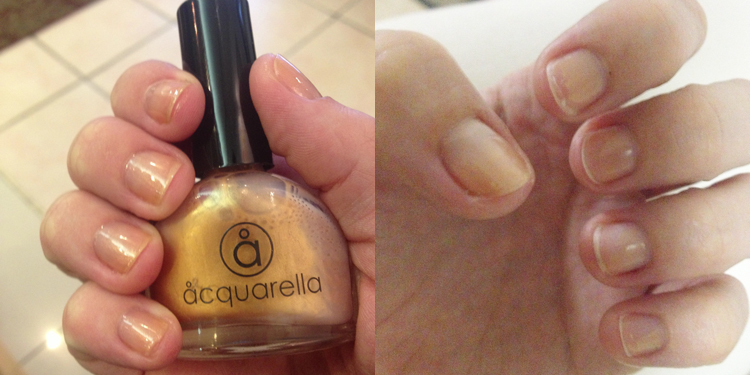 The golden color looked washed out after I got a few coats on my nails, and within days it was peeling. Plus, let me get real with you, I bite my nails. And I need an actual barrier between my teeth and nails to dissuade me. I ripped my nails to shreds while wearing this. Conclusion: This gives non-toxic beauty products a bad name. Keeki nail polish is as cutesy and natural as they get, with young colors and only five ingredients, one of them being water. 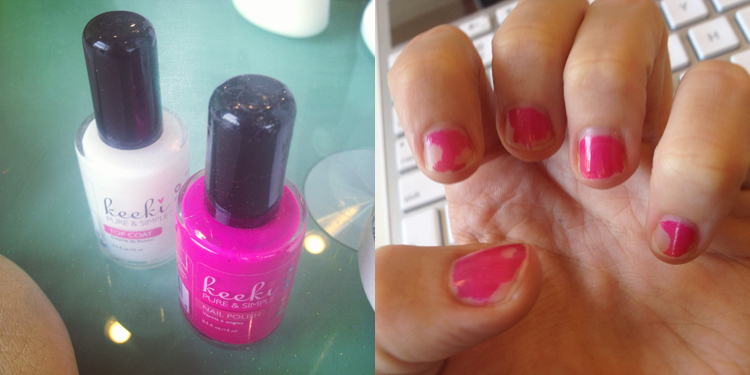 Unfortunately, it reminded me of the Barbie “nail polish” I had when I was six. Barbie nail polish was fun, because you would paint it on, wait a couple minutes for it to dry, and then peel it right back off. 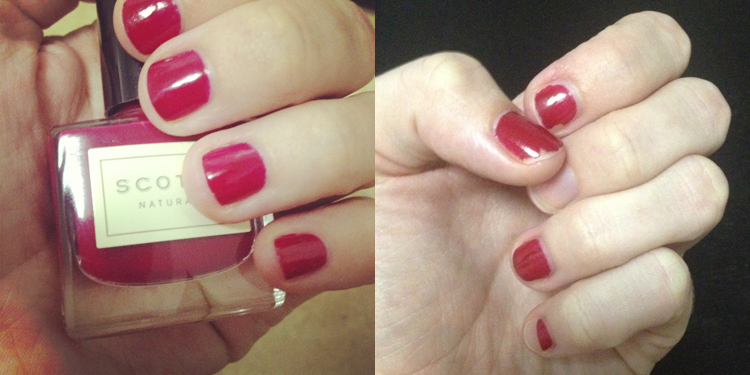 Kure Bazaar nail polish arrives from Paris in a conventional bottle. 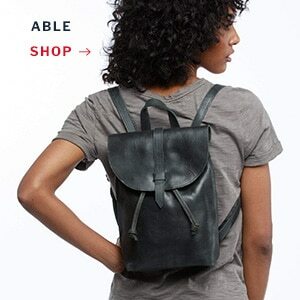 The brand has many ladylike colors to choose from, and went on nicely. Malheureusement, it started chipping by week’s end. Conclusion: Not a disaster, but not worth sending for, either. Quelle domage. This luxe looking nail polish claims to be vegan and 5-free. And after wearing it for two whole weeks, I was actually skeptical of this claim. 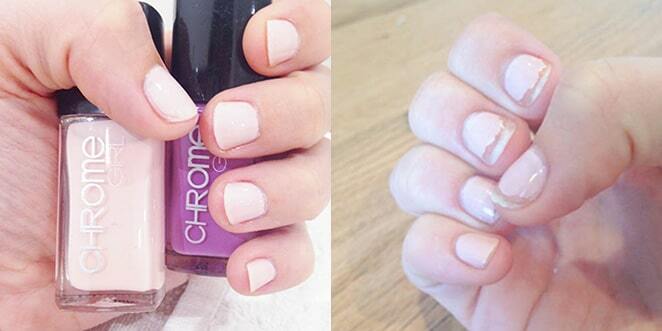 How could a non-toxic nail polish last this long? I immediately bought several more colors. Another darling of the toxin-free set, Priti is the most well-recognized non-toxic and cruelty-free nail polish brand. The only questionable ingredient is butyl acetate. It chips just a bit after a week. Conclusion: Not the best, not the worst. Not to be confused with the non-toxic beauty brand RMS, RGB has a full line of saturated, traditional and edgy colors to choose from, all 5-free. It went on nicely, and lasted pretty well throughout the week. Conclusion: Worth your money. Go crazy and buy a few colors! 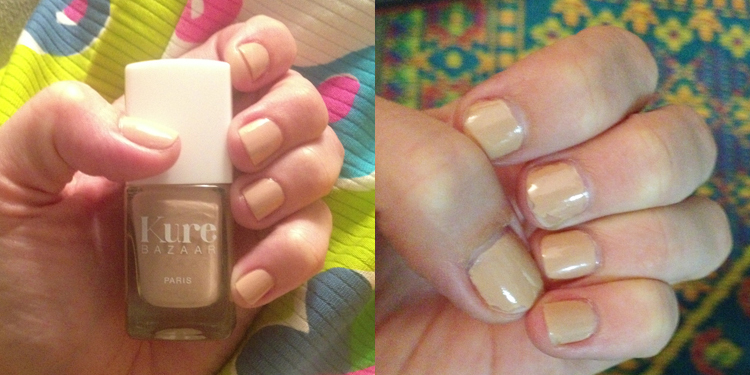 Everyone is in love with Scotch Naturals nail polish. The packaging is beautiful, the colors seductive. The selling point, however, is that it is water based, 3-free, plus free of ethyl acetate, butyl acetate, nitrocellulose, acetone, and heavy metals. (This is all from the website, Scotch isn’t listed on Good Guide.) 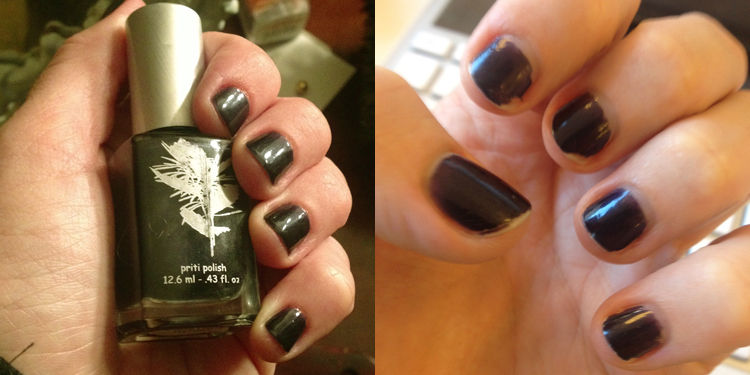 And unlike other brands, Scotch is focused just on nail polish. It’s all over Pinterest and inside Whole Living Magazine. But when I put it on? Oy, more Barbie nail polish. UPDATE: You have to use the Scotch base coat in order for it to perform like it should. Or so a beauty professional told me. Conclusion: Beautiful in the bottle, a big mistake out of it. SEE UPDATE ABOVE. Zoya is the brand of nail polish you’ll find most often in professional, non-toxic nail salons like Sweet Lily Nail Spa and Deva Spa. It’s been awarded as the longest wearing natural nail polish by an independent panel in Women’s Health Magazine, and is free of toluene, formaldehyde, DBP (phthalates) and camphor. There are over 300 gorgeous nail polish colors to choose from, so good luck choosing a favorite. It went in shiny, smooth and at medium thickness. It held up fine over the next week, though some other options do a little better. 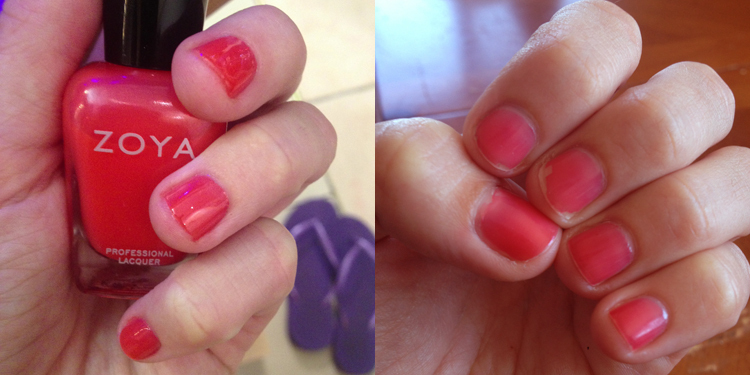 Conclusion: A good choice if you’re at the nail salon, and worth the money. 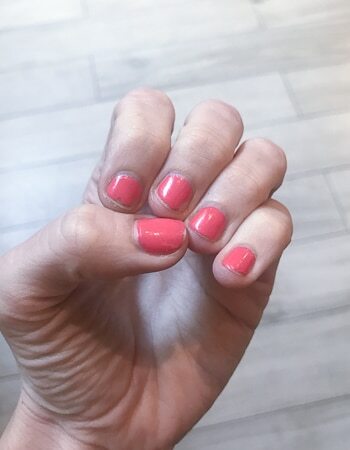 I was offered the chance to review this 5-free polish* and was excited to try out their neon-pastels, a departure from the color palette of other non-toxic brands. I took it to my favorite non-toxic salon and had them apply it to my finger and toenails. Unfortunately, it started chipping pretty quickly and six days later had become embarrassingly bad. It’s still OK on my toes, though. Conclusion: If you must, stick with a pedicure. 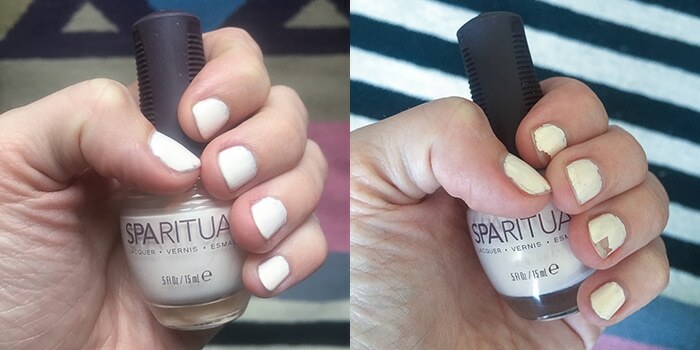 SpaRitual sent over a bevy of pastel spring colors to try. * The lacquers are vegan and free of DBP, toluene, camphor, formaldehyde and formaldehyde resin. 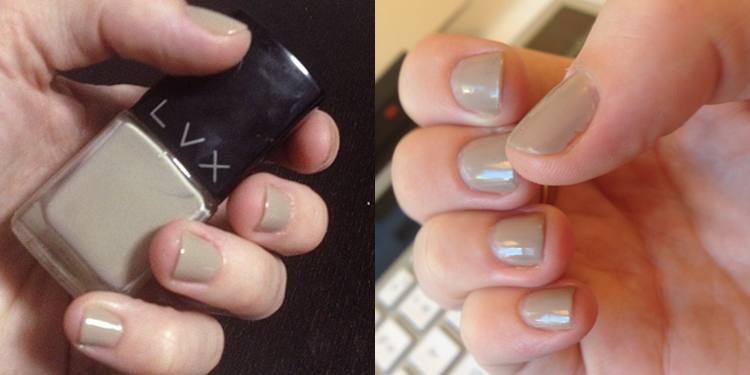 I tried both the lavender and white colors, and found that it was definitely the thickest nail polish I’ve tried. I personally really don’t like thick nail polishes. They tend to go on sloppy, and even though I parked myself on the couch for an hour to wait for them to try, I still managed to mess up a nail. A week later, it had started chipping. 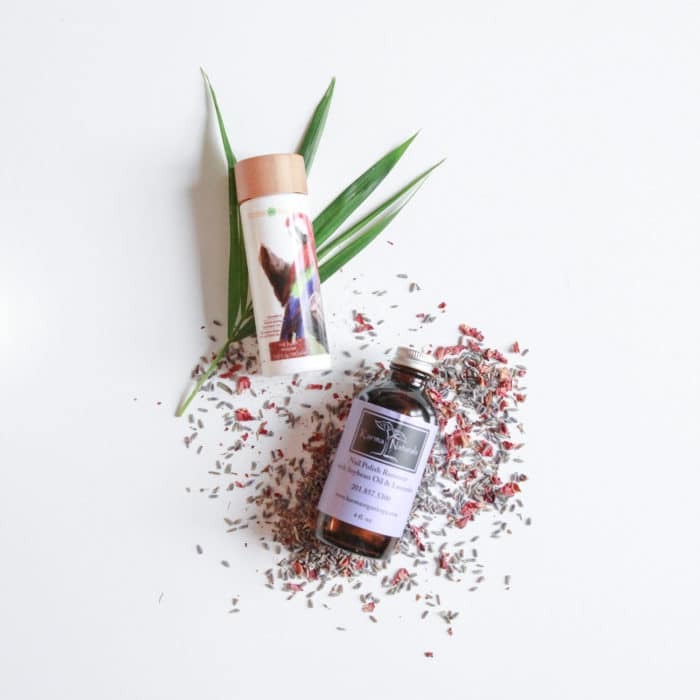 Both of these nail polish removers – Surya Brasil Exotic Animals Nail Polish Remover and Karma Naturals Nail Polish Remover work equally well. Karma Naturals is an industry favorite. Despite it’s less-than-chic packaging, you’ll find it in natural beauty stores everywhere. The lavender scent is my favorite! It’s soy-based, non-toxic, free of any petroleum ingredients, and packaged in a 100% recyclable glass bottle. Surya Brasil is a newer product, but it works just as well, and has a luscious tropical scent. It’s organic, vegan, and crueltyfree. Its Patauá, Argan and Buriti organic vegetable oils provide hydration, to prevent dryness and white spots on the nails and cuticles. It does not contain Acetone, BHT, Formol, Glycols, Mineral Oil, Parabens, Liquid Paraffin, Silicone, or Toluene. *They sent me free nail polishes to try.